Growing up, I was taught that the early bird catches the worm. Well, as a weekend market lover, I’d say, the early visitor gets to try the yummiest dishes in the market! It was a sunny Saturday morning and the Salcedo Market was already brimming with shoppers filling up their carts with fresh vegetables, hot-off-the-grill meats and ready-to-eat international dishes. Everything looks oh-so-good that it’s really hard not to give in to the sweet, melt-in-your-mouth look of the Baklava or the meaty aroma of the Shawarma, and what about the infamous crepes and galletes that have all the toppings available to satisfy your craving? Well, my latest visit to the market was different. This time, I went with a mission and I am determined to succeed. With only P150 in my pocket (and my ATM card intentionally left at home), I will shop around the market and see what type of meal I’ll end up with. True, that when going around the Salcedo Market, it feels as if you’re on a gastronomical trip around the world. From India to Turkey to China and of course to the different regions in the Philippines, no passport is required to experience world-class cuisine. What I love also about the market is that most of the dishes are reasonably priced. No need to break the bank just to shop here. Today, I wanted something light and healthy. Since it was way too early in the morning, I decided to have breakfast. I have always been a fan of Gigi La Crepe and more so of his Galette Complete (P100). Galettes are the savory version of its more popular counterpart known as crepes. Unlike crepes that make use of regular flour, galettes are made using buckwheat flour. Also, it is only cooked on one side and is normally served with vegetables, cheese, egg or meat inside. Watching the stall owner, Gigi, prepare my galette is also an additional treat. He would engage you in stories about the market and would talk animatedly about his crepes and galette which at all times would make you want to try them all. Galettes are best eaten warm. I took a comfortable spot at the dining area of the market and carefully opened my styro box to enjoy my yummy looking French breakfast. 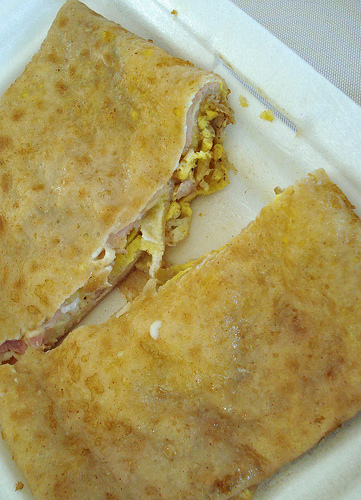 I love the combination of ham, cheese and egg in my chosen galette. The egg was kept soft and fluffy inside exactly just the way I like it. After enjoying my galette, I walked around the market and bumped into a friend who told me to try the Chicken ala King in patty shells from Pamangan. I told her that I might have to pass if it’s too heavy since I just enjoyed one order of galette. She told me not to worry and even offered to share it with me. 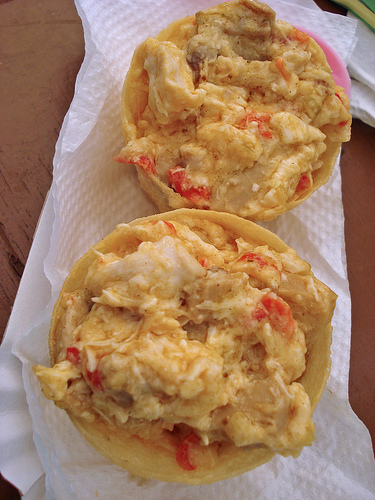 We reached the stall and what I saw are mini patty shells with a generous serving of Chicken ala King inside. Oh-so-cute! It’s worth Php. 30 each which is still within my budget for the day. We agreed to get one order each and happily carried our mini tray back to the dining area. Don’t be deceived with its tiny size as the filling consists of tender chicken chunks, crunchy vegetables and a really flavorful sauce which I instantly love. Being the OC that I am, I ate the filling first and munched on the patty shell after. My friend, on the other hand, happily devoured her Chicken ala King in just four giant bites. By the time we finished eating, the crowd has tripled in number and there’s hardly any empty table at the dining area. I realized it’s also time to go and so I bid my friend goodbye while thanking her for the wonderful recommendation. Once again, another wonderful Saturday morning at the Salcedo Market. Total expense? P130. Mission? Complete. oh, and congratulations for spending just P130! too many temptations in salcedo market for me, maybe your "just the right amount of money in the pocket" is a good idea to try so i wont splurge! thanx for the post! I too love the Chicken a la King! I would crave for it so much and make a beeline for it on Saturdays. I looove the chicken ala king and the kilayin with rice from Pamangan! yummm!